The weather reports and warnings about Hurricane Iselle and Tropical Storm Julio approaching the Hawaiian Islands are worrisome. It’s a rare double threat for the Hawaiian Islands. These two tropical cyclones present a back-to-back risk within as few as 10 days apart. Meteorologists say that they have to go back to 1949 to find a case when tropical cyclones with direct impact to the Hawaiian Islands were 10 days apart. These two storms are predicted to hit Hawaii within two to three days. “Unprecedented in the satellite era,” is how Kevin Roth, lead meteorologist at The Weather Channel, described it. In travels to the Islands of Hawaii, the one word that always comes to mind is peaceful. So, this forecast warning residents and visitors to prepare for a state of emergency makes my heart break. The Big Island will be affected first. The National Weather Service has issued a Flash Flood Watch for the entire state of Hawaii from 4 a.m. on Thursday until 6 a.m. on Friday. This means that conditions on all islands may develop and lead to dangerous flash flooding. One would have to go back more than six decades to find a case of two tropical cyclones with direct impact reaching the Hawaiian Islands—and they were 10 days apart. In 1994, there were three storms that passed the Hawaiian Islands—Daniel, Emilia and Fabio. Two out of the three, however, had fizzled out quite a bit before they hit land. The current models predict that there is a 50 percent chance of tropical storm force winds affecting Hilo on the Big Island, a 44 percent chance of tropical storm force winds in Kailua-Kona and a 42 percent change for South Point between Thursday and Friday. My thoughts are with the residents of the Hawaiian Islands—and the visitors. Below is a photo of a sacred place on the Big Island—Waipio Valley. 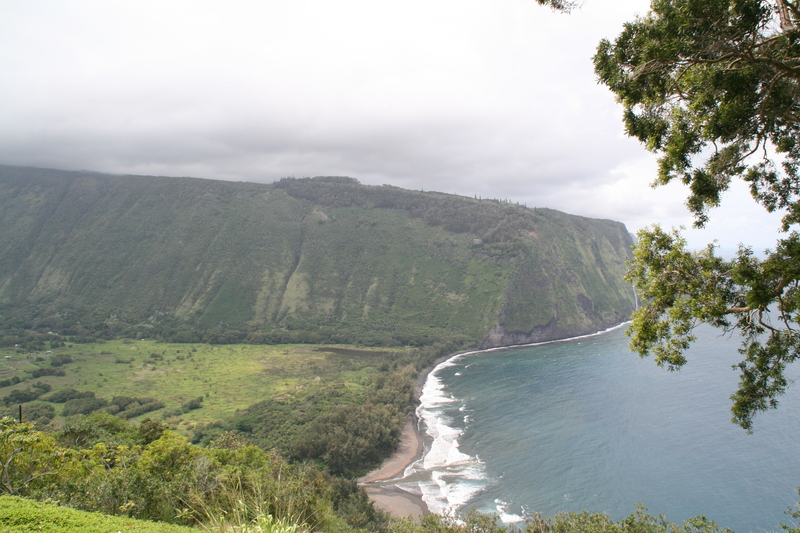 This photo was taken from the Waipio Valley Lookout in March of this year. Waipio means “curved water” in the Hawaiian language. Wishing all in beautiful Hawaii safety from the storm. This entry was posted in Big Island, Environment, Hawaii, Hawaiian Islands, Hilo Hawaii, Kona Hawaii, Travel, Tropical storms, United States, Weather and tagged Big Island, Hawaii, Hawaiian Islands, Hawaiian weather, Hilo Hawaii, Kailua-Kona, Travel, Travel and tourism, tropical cyclones, United States by alohajournal. Bookmark the permalink. Will definitely be keeping them in my thoughts…my heart is always in Hawaii…thanks for the post and update. We're the other Hilo Farmers Market, the one with parking!